Difference between revisions of "Woodsdale"
Woodsdale is a member of the Northern Cities Organisation (NCO). Yu can see their wiki page by [[NCO|clicking here]]. Woodsdale is a member of the Northern Cities Organisation (NCO). You can see their wiki page by [[NCO|clicking here]]. The Republic of Woodsdale (Malay: Republik Woodsdale) is a town founded by Hightech_TR. It is located in the northern area south of Gold City and east of BirchView at ZN10 . The city's current development stage is the Alpha Phase. This is the up-to-date history of Woodsdale from July 2015 to present. It has been a long way since Woodsdale's founding. On the 6th of July, 2015, Hightech_TR was accepted as a Member of the MRT community. He placed down claiming signs at ZN10 , thus marking the start of Woodsdale. He began building by cutting down some trees and terraforming the land. Station Ave., the first road in Woodsdale, was built. Soon, on the 10th of July, 2015, the uCar rental building, the first ever building in Woodsdale, was completed. This marked the start of the early foundations of Woodsdale that made it a success. Hightech_TR started on the PiggyHoi district, which got its name origins from the mobile game Angry Birds. He has decided that this should be the economic centre of Woodsdale, where many franchises of sorts were to be built there. He then started on constructing Woodsdale Plaza (present PiggyHoi Plaza). It started off with the popular Eat and Bowl on the 1st floor, slowly progressing its way up to the 10th floor. The foundations for Rainbow Heights, currently the tallest building in Woodsdale, was formed. A Sonamu was then ordered and constructed nearby. Slowly, this district began to form its shape and become a successful economic place in Woodsdale. The Zephyr District was founded along with the entire town. Problems were faced during its construction, where the trees and hilly terrain from the Roofed Forest made it difficult to build. The town hall was completed eventually, and ZN10 station was remodeled from the outside. More buildings were completed, and soon the WoodsWheels bus service in Woodsdale started building bus stops and buses. This district had been one of the most difficult projects in Woodsdale to be completed. Before the [Mayor] rank was reached, the Zephyr District was fully expanded. _frozen had planned the Maidenhead Line to branch off from the main line to connect Gold City and Woodsdale to the rest of the line. Hightech_TR has approved this plan and the station was built. Trains had been connecting Woodsdale to the rest of the MRT community via Pacifica Rail. This was the big project hosted by Hightech_TR to make some terrain-relevant changes to the Zephyr District in Woodsdale. This project includes a massive clearing of trees in the Roofed Forest and major terraforming of land around the Pacifica Rail station. Multiple players helped in this project, with it being completed on the 24th of March, 2016. Upon an endorsement request to Aliksong, Hightech_TR has found out that Woodsdale did not seem to fit his standards for the [Mayor] rank. Hightech_TR decided to blow the horn and declare the Emergency Crisis. Over time of desperation, he was working immensely on Woodsdale, putting TR and Co. on hold. Upon KevinTheLlama's promotion, Woodsdale became inaccessible to any player in the MRT, with its MRT station closing down and making sure nobody interfered with the state of the town. The Emergency Crisis ended with jphgolf4321 promoting Hightech_TR to [Mayor] on the 1st of April, 2016. Work on all targets resumed to normal and Woodsdale became reaccessible to all players with the renovation of its MRT station. The Woodsdale LRT is Woodsdale's mode of transport around the town. It would connect all 7 districts of Woodsdale together. This project was planned by Hightech_TR in Woodsdale's mid stages of development. A model of Woodsdale LRT stations were built in the lab world, with a custom built station system that handles all trains entering and leaving the station, trains being dispensed and trains being disposed from the Empty Cart Detector. This custom built system, along with the track powering system, is patented under LRT@WTA. The Woodsdale LRT, together with its other rail and road transport modes are monitored and handles by the Woodsdale Transport Authority. On the 26th of April, 2016, the first two stations comprising the first stage: Woodsdale and PiggyHoi stations, were completed and opened. The Woodsdale Branch of Sonamu had fallen victim under the major Sonamu Crisis of 2015. HanSangYoon has actually ended the crisis, where Hightech_TR thought that Woodsdale Branch of Sonamu would continue progress. However, his perception was wrong. The massive store remained unfinished for over 9 months, without any notification of any progress. The unfinished store stains the beauty of the PiggyHoi district and creates a concern with Hightech_TR as he thought that one day, progress would be made on the Sonamu, but it never happened. As he did not want to bug HanSangYoon by asking him to continue work on the Sonamu, he could not do anything but sit and watch helplessly. This Sonamu was demolished in December 2016 to make way for a General Motors. A new Sonamu will be constructed in the PiggyHoi district as part of the Southern PiggyHoi Expansion. Woodsdale has approved connection of its town to the two roads A90 and B17. Construction of the exits commenced on July 26th, 2016 and are expected to finish in November 2016. The two roads will link Woodsdale with other cities such as Armada, Konawa and Springwood directly, and connects to other cities like BirchView and Lanark via other roads. Woodsdale celebrated its first anniversary on the 6th of July, 2016 with the construction of a small stage in Haw Par Villa Park. The celebration was held there with a presentation of Woodsdale's history, a recitement of the pledge and a firework run. Only two people have watched the celebrations this year. Woodsdale has approved the connection of its town to several third-party rail lines, mainly the Grand Central, RaiLinQ and ChromaRail, owned by allifarki, autobus22 and KevinTheLlama respectively. They commenced work in November 2016 and is expected to be completed in the 1st or 2nd quarter of 2017. The Citirail closed to make way for the opening of the RaiLinQ in December 2016 due to the station being inactive. The rest of the rail connections will remain closed until Senator is reached. News spread over the MRT server that allifarki has permanently taken a break from building in the server. Hightech_TR carried out a poll if the town staff of Woodsdale should be modified from this. The results of the poll were 6 for Yes and 1 for No. Resulting from this, allifarki had been demoted to the Councillor rank, ModernArt had been promoted to Head Councillor, and KevinTheLlama had been promoted to Deputy Mayor of Woodsdale. The Woodsdale Bus Refurbishment Program replaces the old and unreliable ZongTong PresidentShip MK889L buses with the more reliable //Voltorb metroCITY K buses from aviaracer. This program was started by allifarki in the first place, but he left the server before he has gotten his buses ready. Following Voltorb Buses's demonstration bus in Woodsdale, Hightech_TR purchased the bus for the entire city. Over a year after the promotion to Mayor, Woodsdale claims its [Senator] rank in the City Rank Promotion Bath #13, announced at the June 2017 GSM on 18th June 2017. 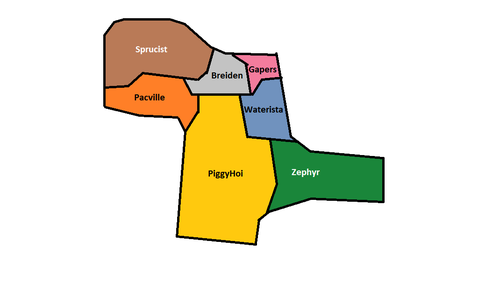 By now, Woodsdale's Zephyr and PiggyHoi districts have been fully expanded, Waterista and Gapers has been founded. The voting for Woodsdale came out at a impressive score of 9/9, a guaranteed promotion. Woodsdale finally turns two on the 6th of July, 2017. The event, WD02, was way more successful than the first anniversary event. Instead of a history showcase, there was a game of scavenger hunt, celebrity appearance, a pledge reciting and fireworks. Woodsdale has come a very, very long way since its founding in 2015. Woodsdale's first and only airfield, Charles Edward Berry - Woodsdale Municipal Airport started construction in July 2017 with a plan by EliteNeon, which was later revised to a plan similar to that of Dabecco Regional Airport under camelfantasy. It has 10 small gates and 8 helipads. The B-class airfield is expected to complete by the end of 2017. We pledge of allegiance, to the Republic of Woodsdale. We must stand tall as one united city, to defend ourselves against all odds. We hope to build a democratic society so as to achieve a successful and happy region, for the entirety of the MRT server. The Woodsdale Flag consists of a red, blue and purple stripe across the flag. It is named as such to represent the unity of people in Woodsdale, regardless of race or religion. The Red represents Strength and Resilience. The Blue represents Peace and Calmness. The flag was once designed to have a grass block in the center, which was removed due to the grass turning to dirt in the 3 x 5 model of the flag. Woodsdale will have 7 districts. The following shows the districts currently established in Woodsdale. The layout of Woodsdale's 7 districts. The Zephyr District is a commercial district which was established at the founding of Woodsdale, which is the 6th of July, 2015. Located in eastern Woodsdale, it is the centre of transport in Woodsdale, housing [ ZN10 Woodsdale] at 3N-7N Station Ave. which is the first ever road built in Woodsdale. It contains other rail connections such as the Pacifica Maidenhead Line, Woodsdale - <WDE> Station, Woodsdale Station of the Grand Central Main and Branch Lines, RaiLinQ North Western Line (Stoptrain Wazamawazi - Birchview) and ChromaRail. It also houses the town hall, and Woodsdale's Charles Edward Berry Municipal Airport, a B-class airfield. The PiggyHoi District is a commercial and residential district located in southern Woodsdale. It is also known as the Franchise District. Most of the stores operating in Woodsdale are located here. Examples are Italiaso, General Motors, The Nutella House, Catronics and many more. The Waterista District is a commercial district located in south-western-central Woodsdale and contains all the embassies in Woodsdale. It contains connections to the A90. The Gapers District is the Central Business District located in north-western Woodsdale. It will comprise of the central workplace for Woodsdale, including TR and Co.'s regional headquarters and other regional HQs. It also has a connection to the B17. The Breiden District is a future district, planned for commercial and residential use. It will be located in Northern Woodsdale. The Sprucist District is a future district, planned for industrial use. It will be located in north-western Woodsdale and is not known much except that it will house the future Woodsdale Sprucist Airport. The Pacville District is a residential district south-western-central Woodsdale. This district features the biggest hill in Woodsdale as of now, Mount Pacville. 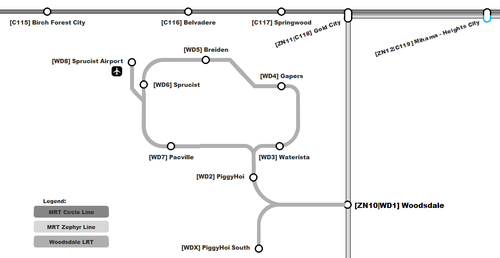 The Woodsdale LRT map, including parts of the Zephyr and Circle Line. The Woodsdale LRT connects all 7 districts of Woodsdale together. Star Fuel Hightech_TR 1 Station Ave.
QueenSmae 1 Emarty Village Rd. LithiumMirnuriX 3 Emarty Village Rd. hvt2011 2 Emarty Village Rd. FredTheTimeLord 19 Emarty Village Rd. aviaracer 17 Emarty Village Rd. ByteMega 4 Emarty Village Rd. Woodsdale has built embassies in the following cities. There is one more embassy of Woodsdale which I have forgotten the location of. Please /mail me in game if that town/city has a Woodsdale embassy that is not on this list. The following shows the Shared Municipalities and Metropolitan Planning Organisations that Woodsdale is a member of. Note that Woodsdale used to be a member of the League of Cities, which was dissolved in May 2016. Woodsdale is part of the Yaxier Alliance (YA). You can see their wiki page by clicking here. Hightech_TR is the Army General of Yaxier Alliance. The Woodsdale Interior and Defence Force (WIDF) is thus the corresponding army for YA. Yaxier Alliance is currently unoperational. Woodsdale is part of the Central North Association (CNA). You can see their wiki page by clicking here. Woodsdale is a member of the TRONC MPO. You can see their wiki page by clicking here. Woodsdale finally joins the United Cities almost two years in its age. You can see their wiki page by clicking here. Woodsdale is one of the 4 cities comprising the Ionian Conurbation SMP. You can see their wiki page by clicking here. Woodsdale is a member of the Northern Cities Organisation (NCO). You can see their wiki page by clicking here. Woodsdale was planned to be near A26 - C107 Armada, then was relocated to be near A6 - T7 Basking Ridge but finally ZN10 was chosen. Hightech_TR actually 'reserved' ZN10 for Woodsdale when he was still a [Guest] but when he got [Member], he successfilly claimed it for Woodsdale. The town name Woodsdale came from Woodlands from Singapore, Hightech_TR's home country and Cloudsdale from the TV programme My Little Pony: Friendship is Magic.